Always address HVAC unit problems as quickly as you can to ensure that the air quality inside your property remains fresh and safe. Don’t allow problems to escalate by preventing small issues from growing into larger ones. Our team will identify any issues and carry out HVAC unit cleaning along with any repairs that are needed, both speedily and professionally. It is vital to pay particular attention to any changes to the performance of your HVAC unit. These warning signs include strange noises or nasty smells. Both these occurrences, along with many others, are an indication that a component is broken or something is restricting the unit’s air flow. Our local team of experts will visit your property, identify any issues, and carry out the necessary work needed to provide a solution. In order to identify any problems and find viable solutions, it is important to understand just how your HVAC unit works. It is also advisable to carry out air quality testing in order to highlight any dirt particles and contaminants. While it won’t necessarily pinpoint the exact root cause of the malfunction, these pollutants are an indication that a potential problem exists. In some cases, it could be an air duct issue or even something wrong with another part of your property. HVAC unit cleaning and maintenance is vital to ensure that not only dirt, dust, and pollutants are prevented from entering your home but also that your unit will be thoroughly checked. Should our team in Poway discover any minor issues during their inspection, they are qualified to make on-the-spot repairs and prevent any future issues. Ensure your HVAC unit is clean, fresh, and energy efficient. 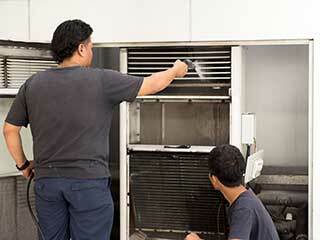 Contact our technicians at Air Duct Cleaning Poway, CA now to schedule a convenient HVAC unit cleaning appointment.